Washington, DC—After nearly 2 ½ years of legitimate questions there is mounting evidence that shows Barack Obama was born not in America but, Kenya, Africa. Obamas lawyers have earned some $1.5 million dollars successfully protecting his birth, passport, school loan and IL State Bar records from exposure. The only answer for that is obvious and that is Obama was born in a Kenya maternity hospital as his very own paternal grandmother publically proclaimed. United States Army, Lt. Colonel Terrence Lakin refused to deploy to his duty assignment in reasonable belief that Obama is unlawfully holding office. If Laken was correct in his assertion any order from Obama would be null and void. We will not learn anything from this prosecution since the judge refused to order the records open or to even put Obama under oath. Lakin was convicted on one charge and pled guilty on another related to this issue. 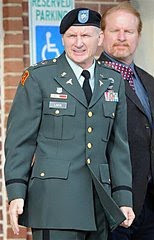 Now this physician/soldier who previously had a stellar service record faces three and a half years in federal prison. It’s Christmas which may not mean much to Obama but he should do the right thing and show some class. I somehow know what to expect from Obama and it won’t be mercy. Watch this video I put up that shows the documentation of his birth and how NBC anchor, Brian Williams refused to follow up in this area during an interview with the anointed one. Executive Order #13489 explaines alot.If you claim to be the Presidency of transparency,then why do you seal your records and abuse the system? ?His FIRST official act. Let the impeachment hearings begin in 2011!! !